Next Friday, 20th March 2015, the best eclipse in over 50 years will reach between 90-95% of totality in the skies over Scotland. The online physics communities have been awash with chat and links on how to view the event, and what useful physics can be done with classes. 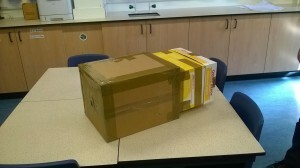 Hoping to do something with my own pupils during the eclipse, and having ear marked some time to prepare, I set about the task of making my own eclipse viewer using a couple of cardboard boxes, a sheet of tracing paper, some black card, a cheap webcam and lots and lots of tape. There are many examples of eclipse viewers available online, and while this may be similar to some, it is more or less of my own design, cobbled together and honed by trial and error, rather than carefully planned. 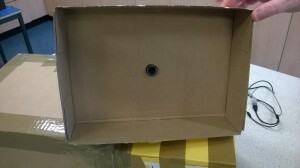 The first step was to find a decent sized carboard box, which was sealed up with tape to make it fairly light-tight. Having done this, one end was cut out to fit a screen made from a sheet of tracing paper, and the other end had small hole cut for the pinhole card to be fitted over. In order to view the screen in relative darkness, I fitted another cardboard box (the type that reams of printer paper come in) with its bottom cut out to fit over the screen, and fitted the lens of a webcam through a hole cut into the centre of the lid. 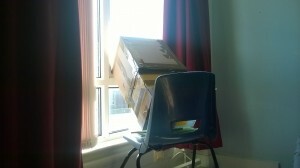 Once the box lid was fitted, the whole assembly was pointed out of the window at the sun and the webcam hooked up to my laptop. 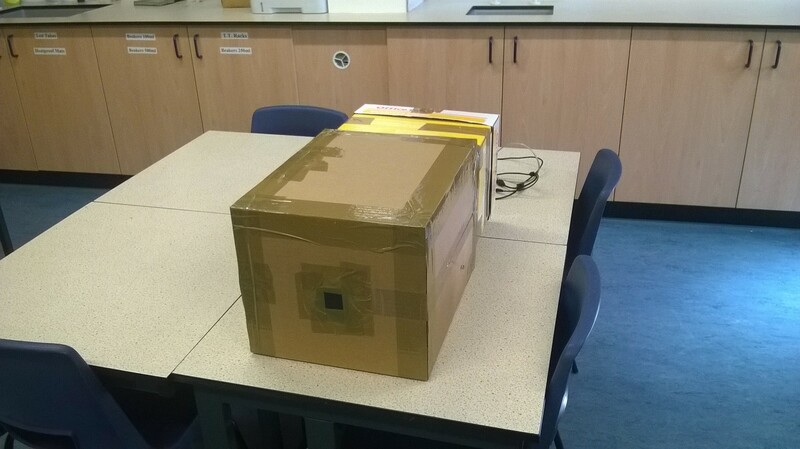 The plan for Friday is to use the viewer in conjunction with a number of other measuring devices, using a couple of the school's ALBA interfaces. One interface will use a light sensor attached to the top of the viewer to measure the light level the eclipse and a temperature probe placed in a vented white box outside the window to measure the air temperature during the eclipse. These devices will be connected to a machine showing the images from the viewer, which will be shown along side a real-time graph of the light level and temperature, all projected onto a screen in my room. The second interface will be connected to a GM tube, measuring the background radiation level. As a proportion of the background radiation detected on Earth originates form the Sun, it is possible that some change may be detected during the eclipse. However, given that the average background count is relatively low, with very high fluctuations, it may be difficult to identify any statistically significant change. If all goes to plan on the day, I will begin measuring at around 8.00 am, and continue to take measurements until around 11.00 am. I hope to be able to capture video from the webcam, as well as data from the light temperature and radiation measurements and will post anything of note next after the event.